If Exxon Is for Carbon Tax, Should We Oppose It? 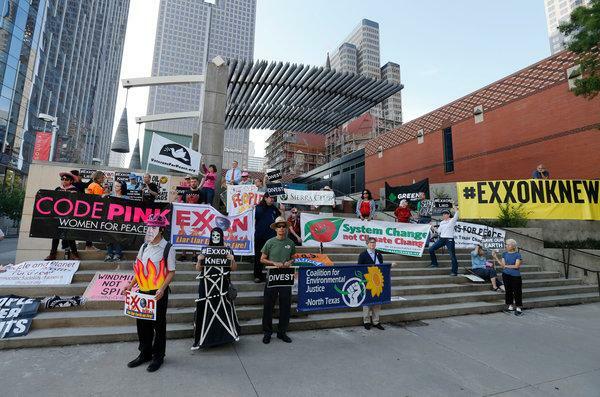 New Orleans The reversal of Exxon Mobil’s position on climate change is important. This is potentially a crack in the wall of industrial and political opposition to this grave threat to the future of the world and its people. The sign of change that is raising interest and eyebrows is the announcement of a $1 million contribution to a 501c4 advocacy organization, Americans for Carbon Dividends. Before we get the banners out for the parade, we need to spend some time looking the gift horse in the mouth. This group has as its co-chair, Trent Lott, the former Senate Majority leader from Mississippi. It is promoting a carbon tax-dividend program first proposed by two former US Secretaries of State, James Baker III and George Schultz, all charter members of the Republican establishment in the era before Trump. Baker, an attorney based in Houston, has been a mainstay of the Texas oil industry for decades, so his involvement particularly has to keep you’re your eyebrows raised and holding back your cheers. The basic proposal is a tax on carbon emissions with the tax paying dividends to consumers in lower prices. Why is Exxon in favor of this? The simple answer is that they are in the famous words of an old friend, “clutching a viper to their breast.” They are savvy enough to know that climate is literally going to hell, so despite Trumpian denials, more – and for them – worst regulations are coming. They are hoping by accepting some tax and this plan that they can semi-swallow they will be able to trade that agreement for something they fear worse: more regulations. And, not only, more regulations but a patchwork from state to state, and maybe even country to country, that makes it harder, and frankly, more expensive for them to follow. Let’s also remember who and what Exxon has been. For decades the company has funded studies in climate change denial and paid for countless ads denying it was a problem. They have paid a battery of lawyers to defend themselves against claims that their own scientists were reporting to them internally about environmental dangers at the same time they were denying it in public. If Exxon is trying to help lead and control its own regulation through a carbon tax, it has to strain credibility to believe that the tax will do the job it should do which is significantly and urgently curb carbon emissions. One-hundred companies are responsible for 70% of global emissions. More than half of global industrial emissions since 1988 can be traced to just 25 corporate and state-owned entities. Exxon is one of these companies. We have to demand more, or we will end up with tragically less. Please enjoy Gone by Cleargreen.